It was a normal day and people would move to their destinations, some by cars while others on foot. The streets were teeming with commuters as it was exactly when people rush to their jobs in the morning. Suddenly, a fierce explosion jolted the diplomatic and highly secured zone of Kabul and sent blowing shockwaves to surroundings within a kilometer or so. It wreaked a massive havoc in human and financial terms, killing nearly 100 people and incurring multi-million dollars loss. Afghan Officials claim the suicide bomber in a sewage truck packed with powder-keg tried to convince the security guards that it is granted permission by an [unknown] embassy before hitting the button on dashboard to implode the staggering 1,500 kg of corrosive explosives. It is an official reasoning and media leaned on it. There are televised commentaries as well as powerful assumptions that challenge that it was a missile that struck the diplomatic enclave. Some 20 to 30 people including security guards in the vicinity of the explosion site have died with no clue of corpse and blown to tiny pieces thanks to the intensity of the blast. One more mystery about Wednesday’s incident is that the militant group can rarely or never possess such powerful explosives that could produce an earthquake-like explosion, and it reveals that something is wrong. The attack had strong impacts as for the first time as an international display of condolence, the Paris Eiffel tower went dark overnight to pay tribute to the Afghan victims. The Afghan president Ashraf Ghani wasted no time to announce the execution order of 11 Taliban and Haqqani inmates to heal the wounds and disarm angry Kabulis and above all to stop a large protest rally from shaping up. But it was too late. The furious Kabul residents concurred to stage an enormous demonstration in protest of the bloody explosion. A notice was well circulated across social media calling Kabulis for a powerful march towards the presidential palace. The peaceful demonstration turned into violence that killed seven people and added to the Wednesday’s deaths. Afghanistan’s wrathful and war-weary population rarely restrains its feelings to avoid a violent protest. In the aftermath of the attack, Afghanistan’s media took to explore facts behind the tragedy. The next day, social media burst with posts that blamed Iranian embassy and Russia for the disaster. The other day media reported that the suspected sewage truck belonged to the company of an Afghan MP, Mirwais Yasini, who is already defamed by social media over being an ISI agent in Kabul. But such allegations could be counted as minutiae for investigation into a terror attack as such. This is a premature and hasty blame-game crafted and unleashed by true masterminds of the attacks to distract general trend from approaching it. The Taliban rebel group denied responsibility and condemned it with words that it only struck civilians. Afghanistan’s intelligence agency hurled the blame on Pakistan-based Haqqani Network which has yet to claim responsibility. Long after the blast, the Islamic State popped up to assert responsibility as though one might have awakened it to assume it. This is all confusing the nation. Almost every catastrophic incident in Afghanistan, notably in the capital Kabul, is followed by a war of words between Afghanistan and Pakistan. The Afghan government now holds Islamabad directly responsible for it, while in early years, it used to blast at Pakistan-based terrorist groups. Undeniably, Pakistan is the facilitator of the insurgent terror bombings in Afghanistan at the behest of others, though it is not willfully and singlehandedly chalking out attacks of this magnitude. The US and also the UK, as main war drivers, quietly sidesteps from the line of Afghan-Pak strife, posing as third parties to the Afghan war. “Afghanistan’s plunging into instability even though the US and allies are struggling to combat”. It depicts the situation in a fashion that empowers the US and allies to endorse its presence on the ground and cement its position about the new war strategy and policy on the horizon. Who draw on the most profit out of such media propaganda? It is the same powers that take a handful of reasons back home to propel their war plans. However, the Islamic State’s capacity to storm Russia sounds implausible. The Afghanistan’s Islamic State, it is argued, is designed to play threat to Russia for its involvement in Syria’s anti-ISIS military campaign that is paying off. What reflects and backs this hypothesis is that the Islamic State’s rise in Afghanistan coincides with Russian intervention into Syrian conflict. We can affirm that ISIS’s fiasco in Syria produced Afghanistan’s branch of the Islamic State in a relatively marginal scale. In the Islamic State’s wicked war on Russia, what is concerning and disastrous for Afghanistan is the way it hurts the people. 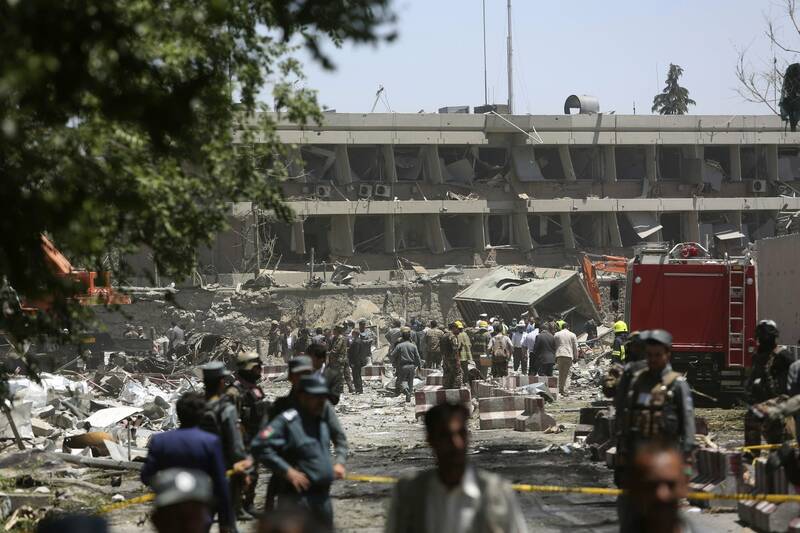 The Kabul’s deadly explosion is a manifestation of this dangerously growing force. The Manchester attack, for example, and Kabul’s attack are both by-products of the inflicted dirty war directed from the same address. As a false-flag, the Manchester’s terrorist assault was an advanced show of the Islamic State’s strength in the face of the world that barely believes in or dismisses the terrorist activities. In the current stretch of history, the warmongers push for an enormous tragedy that can win global heed into the West’s “war on terror”. As much as it becomes tough for a bogus war to produce justifications for its viability that drags on unfoundedly, more deadly events would be imminent, a vortex that Afghanistan is now facing with.